In the fourth pAsuram, parAnguSa nAyaki says “While I am suffering so much that it cannot be tolerated by anyone who sees that, emperumAn who divinely measured the worlds to remove the dangers of everyone, has not arrived. Who will eliminate my endless mental suffering?”. Subsequently, parAnguSa nAyaki says “thrivikraman emperumAn looks prideful with beautiful features due to the joy of having measured the earth which he desired to; who will remove my endless mental suffering now?”. En periya sindhai nOy thIrppArAr ennaiyE? The radiant sun which is attractive during the time of dawn is not coming and hid himself saying that he cannot witness the unbearable great sorrow one gets being born as female; thrivikrama who appears like a prideful bull, who is having vast divine eyes and reddish divine lips as a result of the joy of measuring the earth to keep it for himself, who is having cloud like blackish form, has not come; who will eliminate the great mental anguish of mine which is beyond the conception of thoughts? peN piRandhAr … – Saying that I cannot witness the great sorrow experienced by women who are naturally dependent and hence unable to kill themselves, and being tender natured and hence unable to bear the separation. oN sudarOn vArAdhu oLiththAn – While sarvarakshaka (protector of all) can witness [tolerate] such sufferings, can one (sun) who is engaged in a small act of protection, witness that? While purushOththaman (supreme lord) can witness that, can a purusha (sun, a mortal being) witness that? Even the sun who can dispel sorrows just by his arrival, hid himself and did not show up. Instead of saying “vandhilan” (has not come), it is said “oLiththAn” (hid himself) – this is because, as said in thaiththirIya upanishath “bhIshAsmAth vAtha:pavathE” (fearing bhagavAn‘s orders, wind is blowing), due to bhagavAn’s orders, he should be circling every day [present every day]; such sun too thinks “If I violate bhagavAn’s orders, they may cut my head, which is even alright in comparison to seeing this suffering of the women in separation” and hides himself from the servitors of bhagvAn when they come searching for him. periya thirumozhi 8.5.2 “oLiyavan visumbiyangum thErum pOyiRRu” (the chariot of the sun which travels in the sky, disappeared). It disappeared in such a manner that it’s arrival is not to be guessed; as said in SrIvishNu purANam 5.18.31 “sObhirENur na lakshyathE” (even the dust (of the chariot) is not visible) and in periya thirumozhi 9.4.6 “suzhanRilangu vem kathirOn thErodum pOy maRaindhAn” (the revolving hot sun disappeared with his chariot). im maN aLandha – What suffering engulfed the earth, which made him measure it and accept it? Is the suffering caused by mahAbali to the earth a match for the suffering caused by the night to me? emperumAn who protects without discriminating any one. kaN periya sevvAy … – Out of his mercy, assuming a huge form and measuring the earth, mercifully showering his cool glance to eliminate the anguish of the dwellers of the earth, and smiling out of joy due to such acts – and thus manifesting his reddish lips. em – One who is having as his nature, the protection given for all. kAr – Having his natural complexion, due to protecting them. ERu – emperumAn who pridefully thinks that “doing all of this, is a benefit for me”, has not come. She is saying “em” (our) to indicate that she is also part of the protected persons by the sarvarakshaka (protector of all). When it is recited as “en” (my), it implies – one who has acquired his natural complexion as a resulting of being united with me previously. vArAnAl – He need not beg from me; he need not measure the world, he just needs to manifest his form in front of me. 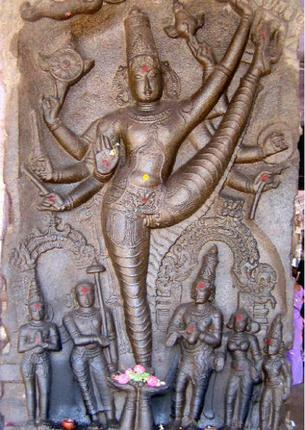 eN periya sindhai nOy – Until now, AzhwAr spoke about bhagavath vishayam (matters about bhagavAn) which is given up to be impossible to speak about by vEdhAntham as said in kEnOpanishath “yasyAmatham thasya matham” (one who thinks he knows does not know); but his own mental anguish (suffering in separation) is difficult to conceive even with the unblemished knowledge acquired by the blessings of bhagavAn. It can only be said as “eN periyadhu” (difficult to conceive in the mind) and cannot be said “how much”. The mental anguish will match the entity [bhagavAn] from whom she is separated. Since bhagavAn has no boundary, the anguish acquired in separation from him also has no boundary. SrIvishNu purANam 5.13.21 and 5.13.22 “thatha:prApthi mahAdhu:kha” (Having acquired great sorrow due to not attaining krishNa, chithayanthI was relieved of all her sins). sindhai nOy thIrppAr Ar – All I need is to have this mental anguish eliminated, even if it means forgetting emperumAn, it is fine. These [AzhwArs] are of the nature to say as in periya thirumozhi 9.3.3 “Edhu seydhAl maRakkEn” (What can I do to forget him? ); it does no matter we remember him or forget him, we need to get the anguish eliminated. Here, saying “forget him” is not done with desire, but only to highlight the great anguish. In separation, the remembrance of emperumAn will increase the suffering as seen in thiruvAimozhi 9.5.8 “kaNNan nAmamE kuzhaRik konRIr” (you recited krishNa’s name and killed me) and in thiruvAimozhi 9.5.7 “kAttEnmin num uru em uyirkkadhu kAlan” (Do not show your form, as that is death to my life). ennaiyE – This anguish is unique to this AthmA (me) alone. People (bhakthi yOga followers) can meditate upon him and eliminate their anguish; it is possible for those who engage in bhakthi considering it as the means [to attain him], since such smruthi (remembrance) is ordained in SAsthram as in bruhadhAraNyaka upanishath “nidhidhyAsithavya:” (to be constantly meditated upon); but for those who are fully immersed in his nature/form, this situation [suffering in separation] is present. This entry was posted in thiruvAimozhi, thiruvAimozhi 5th centum on June 29, 2017 by Sarathy Thothathri.